Like London buses, they say. The wait was arduous, days and weeks and months that turned concern into more than one crisis. The stats that accompanied every opportunity missed became increasingly bleak. Selectors were bereft, supporters exhausted. And then, just like that, two Australian batsmen scored centuries. 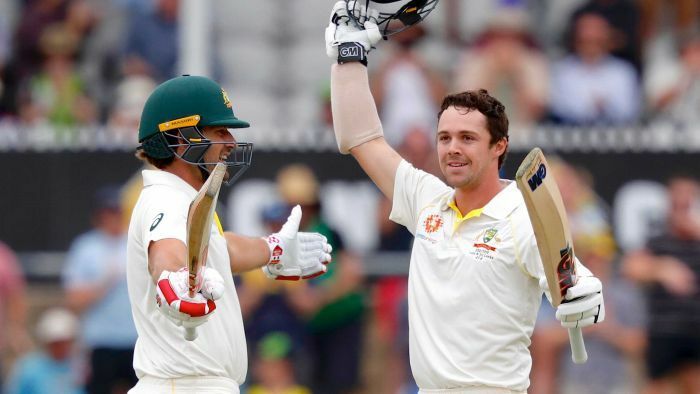 In inauspicious circumstances, under cloudy Canberra skies in the final Test of a series that feels rather tacked on to the season proper, a drought was ended with an emphatic sigh of relief. Joe Burns and Travis Head combined for a partnership of 308, Australia’s highest of the post-sandpaper era. Burns brought up his ton with a nudge to cover just before tea, Head his with a punching cover drive not long after. What was most striking, though, and just a little bit annoying, was how easy it all seemed. After all the trial and error and fury and frustration Australia has experienced at the crease this summer, its cleansing moments didn’t come with a rapid flurry or any great reinvention. These innings were noteworthy for their simplicity, from two players who set themselves a basic plan and had the mental clarity to put them into action. Good ball? Defend it. Wide ball? Leave it. Poor ball? Hit it. Play it safe early, don’t overcomplicate things and keep your concentration. This formula is as old as Test cricket itself, but as the Great Century Drought moved past 100 days and showed no few signs of ending, you could be forgiven for thinking the game had changed. It hadn’t. That it was Burns who brought the barren run to an end is remarkable in itself. Discarded with little rancour after being summoned to dig Australia out of its self-dug South African hole, he was nowhere to be seen when squads were being selected for the start of the summer. Burns was never one to make a fuss. He plays cricket because he likes it and he’s good at it, and if Australian selectors opt to make the most of that then so much the better. Brought into the team for this Sri Lanka series, he’s batted pretty much exactly how one would expect him to and, as a Test record of four tons in 16 games suggests, he was always likely to take a chance to go big eventually. He stays still at the crease, bats from inside the line of the ball to maximise offside scoring but is deadly off the back foot. He keeps footwork to a minimum and, as a result, is susceptible to the swinging ball early, but who in this country isn’t? Burns knows his game and has matured to a point that he is comfortable staying within its confines. Head’s story is slightly different. There was a confidence in his selection before the tour of the UAE to play Pakistan that indicated he was to be a fixture of the summer, and so it has proved. His returns have been sporadic, his means of dismissal occasionally reckless, but upon reflection he’s probably been the one Australian batsman you could say has looked consistently up for the fight. This maiden century casts a different, far more positive light on his Test career to date, some end product after months of promise. By the end of Canberra’s first day of Test cricket, proceedings had become very one-sided indeed. After tea this pitch, which produced only the expected half an hour of spice and not a minute more, was a batsman’s paradise, and absolute nirvana for one already 100 runs and 150 balls into an innings. Sri Lanka’s revamped bowling line-up decayed quickly after a strong start, woefully loose through the second half of the day and promptly taken apart by Australia’s nouveau form pair. They dropped catches like a ball-shy under-11s side, and offered up about as many overthrows too. The world number one Indians these are not, but Australia can only try to beat what’s in front of it. Indeed, the only source of disappointment on an overwhelmingly positive day for the Aussies was the early morning collapse, and the terrifying fragility that it yet again highlighted. Usman Khawaja’s headspace needs extensive study as the wonderful player that exists there has clearly gone missing, and the mass proclamations of Marcus Harris’s success at the top order continue to be chipped away with every wasted chance and every horribly loose dismissal. It was a start that threatened to sink this team to new depths, until Burns and Head said no more. Their respective innings turned the day and this match around swiftly, and could prove to be turning points in their careers. Two swallows don’t make a summer, but they’re certainly a pleasant sight when the only birds we’ve seen to this point quack.